Pearls can be naturally found in the wild. They are the only gems produced by an animal. About 20 of the 8000 mollusk species can produce quality pearls. However, 99 percent of pearls sold today are deliberately grown in oysters. A tiny ball is inserted into the mantle of an oyster, encouraging the production of layer upon layer of nacre. The mollusk secrets this white, crysatlline substance in layers around an intruder in its tissue (an artificial nucleus or a bit of sand in a natural one). After a period of 8 months to 6 years, depending on the type of pearl, the final pearl is formed. Half of all nucleated oysters won't produce pearls. Of the remaining 50 percent, only 5 percent result in top-quality specimens. Nowadays, pearls are not judged by their weight; actually, it's no longer polite to ask about a pearl's weight. The pearls are compared by their diameter, which can be from one to 20 milimeters. There are three main categories; the shape determines their value. The most valuable are the spherical pearls. Symmetrical pearls have oval, button or drop forms and the baroque ones have irregular forms. Pearls are generally strung on silk cord, because the soft thread won't cut into the beads. Knots in between pearls prevent them from rubbing against each other. Also, if the string breaks, the pearls would not all drop off. Necklaces come in several different lenghts, just like skirt hems. There are six standard strand measurements, ranging from 30.5 to about 114.3 centimeters. Each falls at a different part of the body. A collar sits at the throat, a choker at the base of the neck, princess pearls at the top of the chest, a matinee of pearls above the breasts, and opera-lenght at the breastbone. Longer necklaces are known as a rope. She used to wear even seven strands around her neck to everything from office outfits to riding a horse. She worked with jeweler Fulco di Verdura to create her private and boutique jewelery collections. 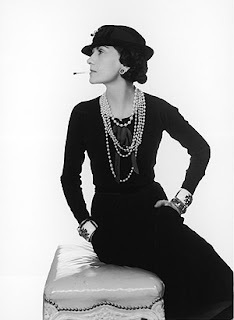 By using glass pearls for costume pieces, every woman could be stylish, not having to spend big money on them. 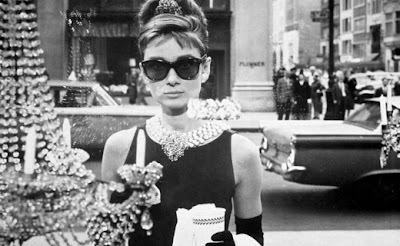 The opening scene of Breakfast at Tiffany's gave a major boost to the jewelry business. Audrey Hepburn's Holly Golightly wears a five-strand necklace as she peers longingly into the Fifth Avenue jeweler's windows. Tiffany &Co. 's benefits from the popularity of the scene even today. Pierre Cartier (1878 - 1964) was a jeweler. Pierre's grandfather, Louis-Francois Cartier took over a jewelery workshop, founding the famous Cartier jewelery company. 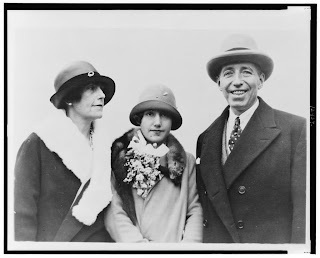 In 1906, Pierre opened the New York store, moving it in 1917 to the current location of 653 Fifth Avenue, the mansion of banker Morton Plant. 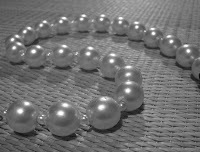 The trade was made over a double strand of natural pearls valued at $1 million. His faux creations are the real deal for many Hollywood, Washington and Royal Family members. Perhaps most famously, Lane was the man behind First Lady Barbara Bush's signature triple-strand choker of imitation pearls.